I have just purchased a clock labled "International Time Recording Co. of New York" "Endicott, N.Y."
The case is stamped "134" I know that the time stamp mechanism has been removed form the clock, but I was wondering how old is the clock? Where did the mechanism go? I was told that the time stamp was a slave mechanism to a central clock. is this correct? Does anyone else have any info on this clock? I know very little about this clock. 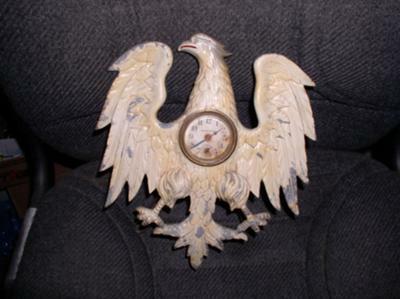 My late husband received this clock from an elderly neighbour in the 1980s (in Ontario, Canada). The clock face says General Electric. 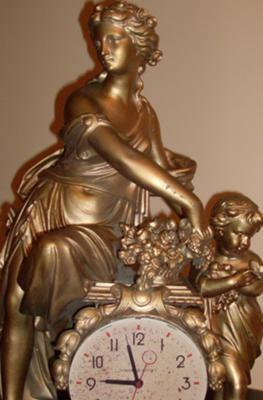 It is an electric clock, I dont know if the clock face goes with the statue or if it was a replacement face. The statue itself is very heavy metal, but I am not sure if it is cast iron. It is painted gold. there are no markings whatsoever on the statue part of the clock. I was wondering who made the statue clock, and how old it is. I also have no idea if it is worth anything. 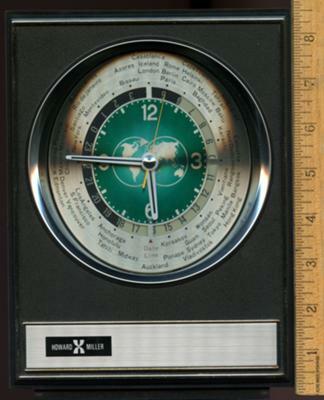 I have been looking on the internet and have not been able to find a similar clock, except the Ansonia clocks, but they dont exeactly look like this either, and I dont think they say general electric. 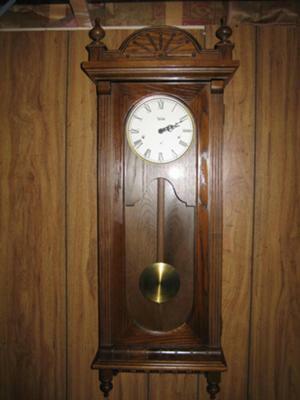 I have a mantel clock made by Hershede Hall Clock Company from Cincinnati Ohio. 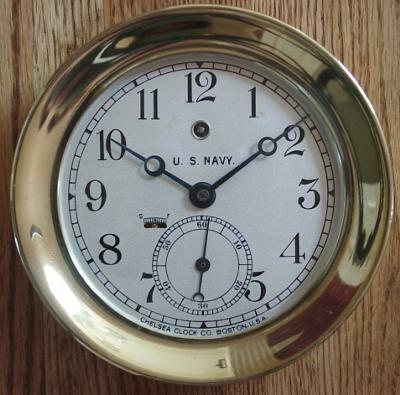 Did a little research and it looks like the clock that won the Panama Pacific Imposyium Grand prize. It's not in mint condition but still operates and sounds beautiful. The working mechanisms are in a-one condition. No rust etc... Can any one tell me more about my clock? Maybe it's value the year it was made...etc.... any information would be much appreciated ! I was given a clock by my cousin. It has Spartus Corporation, Louisville, Miss. Model 6906 on back. It is of a plastic material and depicts a scene of a water wheel which rotates and blue water falling from the wheel which lights the water for an illusion of moving water. A little boy sits on a ledge fishing beside a large tree fishing from a small collection of water at the base of the wheel. If you can tell me about this clock and the date, value, etc. I would appreciate. Thank you! The clock is a building. It has the dates, patent Jan 15th 1878-May 6th 1890 on it. It says Waterbury on the clock face has a working second hand. The clock is in great condition for its age and it winds up on the backside. I do not know the building it is supposed to be. The clock seems to be made of brass I would love to know the value of the clock and if it is a clock made in the USA. This belonged to my inlaws, and looks to be from the 50's or 60's as most everything they owned was. It has a model #7RW001 and "Made in Japan" on the back. I suspect it would only have worth for a collector, and would not be much at that, but am curious as to an estimated value that the charity may hope to obtain from its sale once I donate it. It is in excellent condition and works using one C cell battery. Of course the names of many of the world cities listed on it's face have changed - perhaps that makes it more valuable! Thank you for any info you can provide. I don't have great expectations, just want to give the charity a heads up. White face, says US NAVY in the center. Says Chelsea Clock Co., Boston, USA on the bottom. The back at the top has a number stamped into it, 117553. The number 6 on the face is replaced with a second hand and dial. The front cover unscrews and there is a key slot on the upper portion of the face. It measures about 7.25" accross the front and 2.5" deep. My grandfather purchased this clock from an antique store in Seattle about 30 years ago. My grandmother said he was extremely excited when he bought it because it was the same as the one in his ship during WWII. I have found one picture of it, which I can't find anymore, on the internet, but most have a black face or the second hand is near the top. 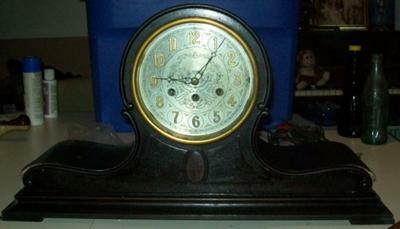 I have searched for this clock everywhere and have not been able to get a name, date, or anything else about it. It has Intermittent printed on the top of the dial pan and made in U.S.A. at the bottom. On the back it says Universal Novelty Co. Pat Pat Pend. It has a wire leg that allows it to stand up on a desk or table. Any help in learning more about this clock would be greatly appreciated. I found an old wall clock on craigslist for $15. I decided to rescue it from an older couple who were ready to trash it. Dusty and with the pedulum halfway in the grave, I picked it up off the floor and took it home in hopes of getting the old ticker runing again. I dusted and oiled the mahogany case, and fixed the broken out side glass. Unfortunately, the clock would't run, so I took it to a clocksmith for repair. The clocksmith said that it hadn't run in over ten years! The cobb webs throughtout the movement were the best indication. Alas, the movement was savagable and after repalcing some parts, cleaning and oiling, the clock will hopfully start to run again. The back panel reads, "Trend clock by Sligh"
Any history or information on this clock would be very much appreciated. I would love to know what it is worth, even though I do not plan to sell it.